The project invested in infrastructure, created a website, designed and promoted a combination of local tourist attractions for individuals, families, schools and companies. Previous rural development support (through Leader +) highlighted the potential to develop sustainable & innovative fishing tourism. Past actions included development of new fishing sites, development of reception infrastructure, mobilisation of village communities & development of targeted partnerships with local food services. This project was designed to further build on this potential by expanding the range of products & services, enhancing linkages between service providers in the region. The LAG Pays de l’Ourthe aims to promote sustainable economic development, balanced between preservation & exploitation of natural & cultural resources. The specific objectives of this project include: (i) Design & development of new nature & fishing tourism products; (ii) Promotion & development of the Ourthe valley as an attractive center for tourism & fishing; (iii) Raising awareness of the diversity of tourism opportunities in the region. Activities included: (i) Investment in new fishing stations, dams & visitor reception areas; (ii) Development of new fishing tourism products & combination packages (& incentives), maximimising synergies with other tourist attactions in the areas; (iii) Development of new local tourist networks & partnerships; (iv) Establishment of linkages with the European Network for Fishing Tourism (through FARNET) to exchange experience & assist in promotion of fishing tourism sites to other regions. (i) Promotion of fishing attractions for individual fishermen, groups, schools, & companies via “incentive” days; (ii) Website promoting tourism opportunities, including combined tourism products on one or more days (e.g Flywalk, River and Chocolate factory, Fishing with friends); (iii) Development of network of partners + linked touristic sites; (iv) Increased numbers of visitors, incomes for local tourist businesses & new job opportunities. 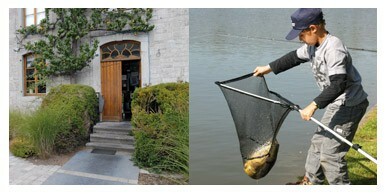 Awareness of fishing tourism is limited in Wallonia. The sector is relatively scattered and its promotion under-developed. The project approach to combine fishing activities with other tourism products has proved both innovative and successful. The approach has the potential to be used in other rural regions in Europe that have similar fishing resources and other touristic attractions and potential.